Description: underpowered cast. Both legs of the loop land at the same time very near each other. 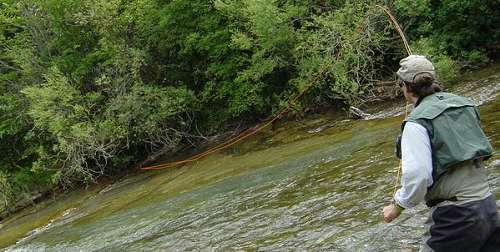 Use: drastic differences in the speed of the water requiring a lot of line upstream of the fly. Execution: very slow, lazy side cast. Greatly underpower a narrow loop to land long before it straightens out. Try to end up with the rod tip slanting slightly upwards so the loop will fall slightly from above. You're applying too much power and the loop travels too fast. Your loop is too open. You have to get the path of the rod tip straighter.